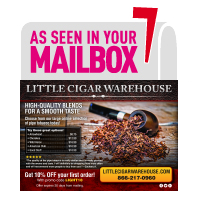 Big flavor in a small package, Talon little cigars are crafted by the same manufacturer of the popular brand with top-quality American tobaccos for a rich, smooth smoke even when you’re short on time. These Talon filter cigars are perfect for a quick smoke break when you don’t have the time or place to enjoy a full-sized cigar. You’ll get classic rich and smooth tobaccos tastes that are cooled off with refreshing flavors. Talon Cigars have gained a reputation as little cigars found in small packages that deliver big flavor. Talon Cigars appeal to cigar lovers of all ages and both sexes since they are available in an array of bold flavors. These include sweet original, menthol, silver, regular, vanilla and grape. Talon Filter Cigars are available in individual packs of 20 cigars which are easy to keep fresh because it's not unusual to find yourself reaching to open another pack in just a few days time. Enjoy your smoke with some of our best Talon filtered cigar brands. Enjoying the cigar is half the fun, but having the perfect one to fit your lifestyle is golden. Buy Talon Little cigars are enjoyed by cigar smokers all around the world, and they offer numerous benefits that keep cigar smokers coming back for more time and time again. Little cigars are great to smoke on the go since they don’t take near as long as a regular cigar to smoke and they are flavorful, convenient, and affordable. Here we have a wide selection of top brand cigars. When you come to us for your favorite little cigars, you will get amazing deals, quality products, and excellent customer service. We also carry a range of accessories and other tobacco related products.